Update 07/20/18: This game is no longer in production because I start a personal game with the same sprite style and humor, sorry. If you want to help, feel free to contact me. Since I felt in love with "Day of the Tentacle" and recently with "Thimbleweed Park" I have a question in mind: How this will look in the DOTT Style? 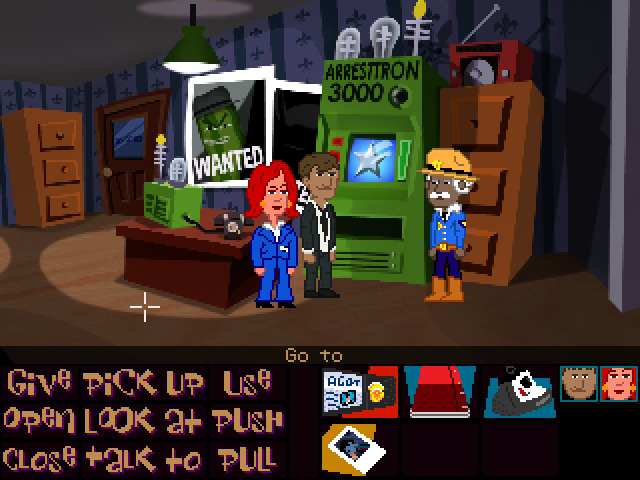 I know here are some people that love DOTT, and Thimbleweed Park is a game that happen in the same universe (the Edison's house is the same of Delores) and the game have a lot of references to "Maniac Mansion". The game will be in Spanish and English. Reyes animations are finished and the playable characters are almost done. I don't have a date of release because I'm the only person working on this, and is in my free time so the progress is slow. Anyone that is interested in help with this let me know. Looks good. Gameplay stays the same though, right? Ron Gilbert is either gonna be pissed and slap a C&D on you, or secretly play your remake, love it, sue you for control of all assets, win, and then add it to Thimbleweed Park as a playable Easter Egg on a computer somewhere in the original game. You realise you're going to have trouble if you try and release this game, right? That's the second most amazing project I have ever seen!!!! Awesometastic!!! I don't think there will be any problems with this project, since Ron is very tolerant towards fangames: just "label them as such, respect the world and the characters and don't claim they are canon". One thing I was curious about, will it have exactly the same plot/puzzles, or are you planning to change something? I really love it when remakes somehow reimagine the original storyline, give it a new meaning or add new plot branches. Hmmmm... there may be a difference in his opinion towards fan games like the Maniac Mansion Mania series where the characters are used in completely new story lines and a game that completely copies the story and gameplay of a game he is currently selling. If this project is completed and is an exact copy of the original comcerning the gameplay and story then if will mean that people can play Thimbleweed Park for free if they don't want to pay the money for the real thing. I realise that it won't have the same voice acting and perhaps not every animation or cutscene but people will still be able to choose it over the commercial product and have a similar experience. This might not be looked on so generously as, say, the AGS remake of Maniac Mansion, a game which is no longer earning Ron Gilbert, and his team, money. I don't want to be negative about what looks like a great project but it would be a shame if a lot of effort was going into something which might never be able to be released. Firstly, I love the concept, and those backgrounds are incredible! The sprites are a bit bad, but I'm sure they'll be improved later. Now, as for the potential legality of this. This is cutting it close. Fan remakes are always illegal as far as I know, but most fan remakes are for game that are quite old, and so no one really cares if they're remade. Thimbleweed Park was released last year! 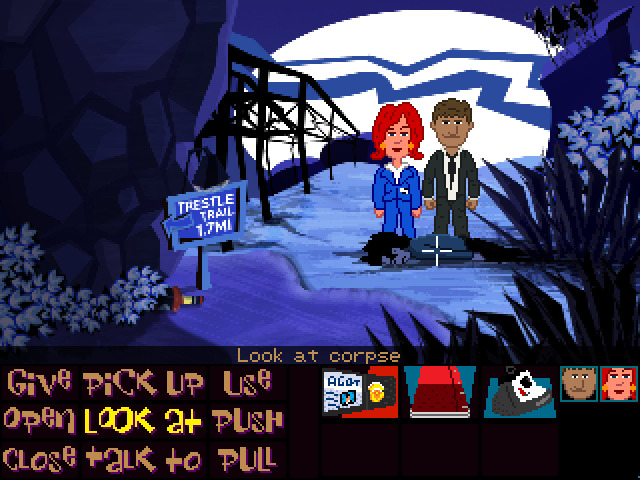 Buuuuuuuuuut, assuming this fan remake is ever finished, then by the time it is finished, Thimbleweed Park will be getting close to ten years old (I mean just look at how long Night of the Meteor and Meteor Mess 3D are taking). In which case I think Ron Gilbert would be glad for the free marketing of the game he made that no one is buying anymore. Heck, by that point in time, I bet Thimbleweed Park would have been given away in a giveaway on GOG or something. So I wish you guys luck. imsomnia212, you clearly have artistic talent, so I'm curious if you have plans to make an original game? Mandle and Danvzare I thought that before starting this project and I was planning to add new puzzles, characters, location and more things, but after seeing your comments I don't want to lose my time on something that maybe I never can release, so I decided to start an own game, and recycle some sprites and things that I made for Thimbleweed. I already have a story for this personal game and maybe can be interesting. That would be great, I happen to have some ideas for exactly this kind of game, and would love to share them! Where I can contact you? So I send you my idea and some wip things. Wooohooo! An original game is 1000 times better than a remake in my book! Looking forward to it! Also, don't throw away what you have, you can still use them in your original game. Change it slightly if it looks too much like a copy of the original. Yeah, I always want to make an original game but I was a little bad with storywriting but I think is time to make it happen. I'm excited to show you all how this will look. Thanks you for the support. you can still use them in your original game. Change it slightly if it looks too much like a copy of the original. Yeah I planning to use some things that I made for the Thimbleweed remake. Today I was working on some characters and bgs, I'm exciting to show some of this in the future. So is this game no longer in production? Yes, you can close it.